I thought you might like to know what goes on when the school goes “quiet,” between the school year and summer camps. You’ll find, like I did, that the spirit of the All Seasons community has lingered–left behind by all of you–albeit with a bit less energy and noise. 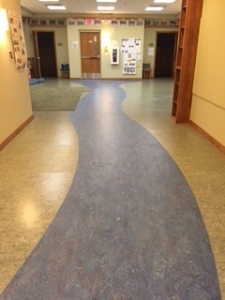 A river was created; friendly, exacting workers came to lay new tile over cracks in our floor. We now have a beautiful blue river flowing the length of the school. Steve, our rock star maintenance man, checked on the progress every day. Fritzie and Mary charmed and serenaded the workers, and when they had their outdoor time, were definitely missed. Fritzie flies again and hosts a sleepover; a collection of chicken poop on Fritzie’s upper ledge and under her perch were evidence that she has recovered from her hawk injuries and taken flight once again—hooray! 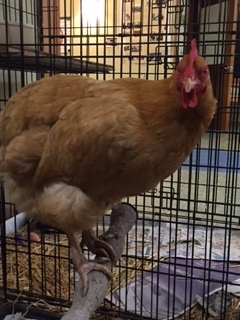 Also, in an unintended experiment, I left the chickens together in the same cage from Wednesday night until Friday morning, planning on trying this new arrangement only for one afternoon, but forgot to separate them at the end of the day. All was cozy when I returned, so we’ve turned another corner and our chickens are good enough friends to be housed together when needed. Dar told me the rabbits were eating our corn. I brought my “Liquid Fence” from home and sprayed the vegetable garden, probably to no avail. Grandma Faye and Lavera were having tea in the Café and then going to the Community Room to hear music. They said it was way too quiet without us. Dar and Shirley asked when we’d be back as did the grandmas getting manicures, as did Sally and Bonnie and Rose. Without the children, Inver Glen is a quiet place. It seems like just yesterday you were dropping your children off for the first day of school. How can it be June? In nine short months we packed it in; endless games of ring around the rosy, scary bears, pirate adventures and treasure hunts, monster chases, cooking sap for maple syrup, cat shows, parades, and more. During and because of these activities, we made connections with each other, with teachers, and with our grandmas and grandpas. We often refer to your children as “our kids” and that sentiment only grows stronger throughout the year. Your children come to feel like our children. Our time together grows more precious as the days left in the year dwindle. In nine short months, your children have touched touched many hearts. For those of you returning for another year- we are counting the days until September! For those of you moving onto kindergarten, know that we will miss you. Our hope is that as the years go by, you’ll keep in touch. Nothing gives us more joy than visits from former students and families and we deliberately schedule times for this to happen. 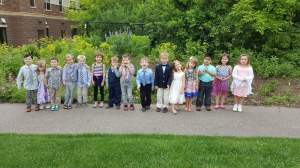 Our oldest alumni are heading to middle school in the fall, but they are still “our” kids. Come back and visit our classrooms, our chickens, and of course our grandmas and grandpas.